The Apache HTTP server is the most widely-used web server in the world. It provides many powerful features including dynamically loadable modules, robust media support, and extensive integration with other popular software. In this guide, we'll discuss how to install an Apache web server on your Ubuntu 16.04 server. Before you begin this guide, you should have a regular, non-root user with sudo privileges configured on your server. Additionally, you will need to configure a basic firewall to block non-essential ports. You can learn how to configure a regular user account and set up a firewall for your server by following our initial server setup guide for Ubuntu 16.04. When you have an account available, log in as your non-root user to begin. Apache is available within Ubuntu's default software repositories, so we will install it using conventional package management tools. After confirming the installation, apt-get will install Apache and all required dependencies. Before we can test Apache, we need to modify our firewall to allow outside access to the default web ports. Assuming that you followed the instructions in the prerequisites, you should have a UFW firewall configured to restrict access to your server. During installation, Apache registers itself with UFW to provide a few application profiles. We can use these profiles to simplify the process of enabling or disabling access to Apache through our firewall. As you can see, the profile has been activated to allow access to the web server. At the end of the installation process, Ubuntu 16.04 starts Apache. The web server should already be up and running. May 19 18:30:09 ubuntu-512mb-nyc3-01 systemd: Stopped LSB: Apache2 web server. May 19 18:30:10 ubuntu-512mb-nyc3-01 systemd: Started LSB: Apache2 web server. As you can see above, the service appears to have started successfully. However, the best way to test this is to actually request a page from Apache. You can access the default Apache landing page to confirm that the software is running properly. You can access this through your server's domain name or IP address. If you are using DigitalOcean and do not have a domain name set up for your server, you can follow our guide how to set up a domain with DigitalOcean to set one up. If you do not want to set up a domain name for your server, you can use your server's public IP address. If you do not know your server's IP address, you can get it a few different ways from the command line. You will get back a few addresses separated by spaces. You can try each in your web browser to see if they work. This page is simply included to show that Apache is working correctly. It also includes some basic information about important Apache files and directory locations. Apache should now start automatically when the server boots again. /var/www/html: The actual web content, which by default only consists of the default Apache page you saw earlier, is served out of the /var/www/html directory. This can be changed by altering Apache configuration files. /etc/apache2: The Apache configuration directory. All of the Apache configuration files reside here. 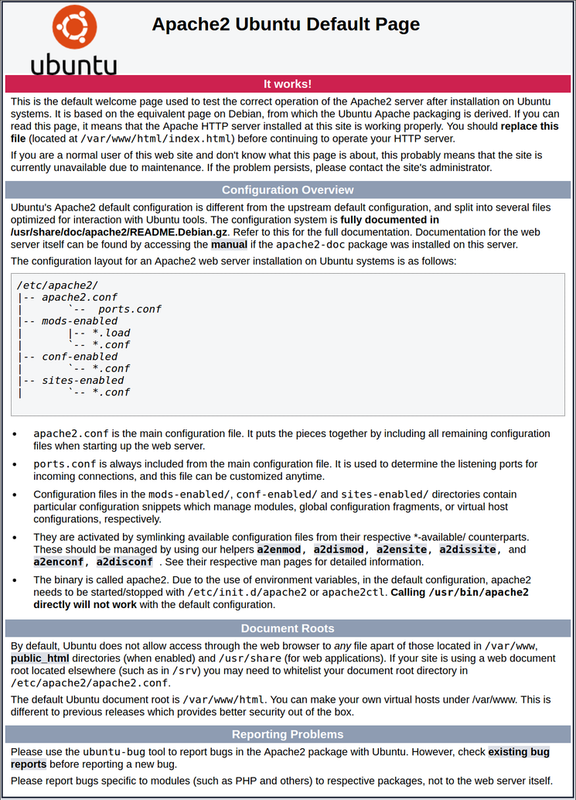 /etc/apache2/apache2.conf: The main Apache configuration file. This can be modified to make changes to the Apache global configuration. This file is responsible for loading many of the other files in the configuration directory. /etc/apache2/ports.conf: This file specifies the ports that Apache will listen on. By default, Apache listens on port 80 and additionally listens on port 443 when a module providing SSL capabilities is enabled. /etc/apache2/sites-available/: The directory where per-site "Virtual Hosts" can be stored. Apache will not use the configuration files found in this directory unless they are linked to the sites-enabled directory (see below). Typically, all server block configuration is done in this directory, and then enabled by linking to the other directory with the a2ensite command. /etc/apache2/sites-enabled/: The directory where enabled per-site "Virtual Hosts" are stored. Typically, these are created by linking to configuration files found in the sites-available directory with the a2ensite. Apache reads the configuration files and links found in this directory when it starts or reloads to compile a complete configuration. /etc/apache2/conf-available/, /etc/apache2/conf-enabled/: These directories have the same relationship as the sites-available and sites-enabled directories, but are used to store configuration fragments that do not belong in a Virtual Host. Files in the conf-available directory can be enabled with the a2enconf command and disabled with the a2disconf command. /etc/apache2/mods-available/, /etc/apache2/mods-enabled/: These directories contain the available and enabled modules, respectively. Files in ending in .load contain fragments to load specific modules, while files ending in .conf contain the configuration for those modules. Modules can be enabled and disabled using the a2enmod and a2dismod command. /var/log/apache2/access.log: By default, every request to your web server is recorded in this log file unless Apache is configured to do otherwise. /var/log/apache2/error.log: By default, all errors are recorded in this file. The LogLevel directive in the Apache configuration specifies how much detail the error logs will contain. Learn how to use Apache Virtual Hosts here. If you'd like to build out a more complete application stack, check out this article on how to configure a LAMP stack on Ubuntu 16.04. How To Migrate your Apache Configuration from 2.2 to 2.4 Syntax.